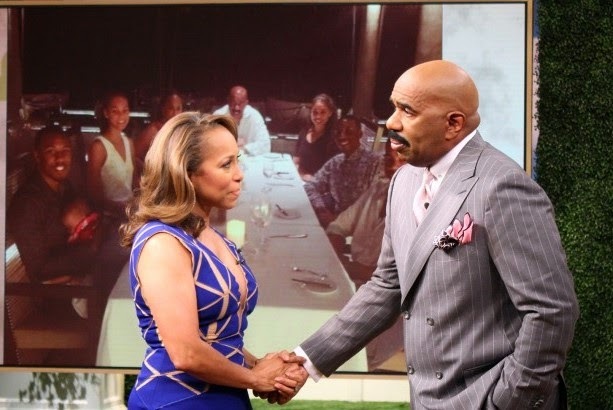 TV and radio host Steve Harvey has had his wife Marjorie appear on his ABC Talk Show for the week-long Mother's Day event, and Steve took out yesterday to praise and appreciate his wife whom he married in 2007. He appreciates her for giving his children a stable home, getting his last son to become academically balanced. Steve married two other women before Marjorie, but says it is his current wife that has made him the happiest he's ever been, that he now lives, and he's not just existing. They saw each other for a short time, but Steve, who had nothing to offer this gorgeous young woman and was always on the road, realized they could not maintain a long-distance relationship. For over a decade they never saw each other. They both married other people, had kids and divorced. During all this, it was his work, not his home life, that was rewarding. Something was missing and he felt it. He hadn’t forgotten the beautiful girl he had briefly known in Memphis years before. He had never stopped thinking about her, nor she about him. Every year or two he’d call her to say hello. It seemed that one of them was always married. Then one day, when Steve was at a low ebb and newly divorced, he called her. He was amazed that, after so many years, Marjorie still had the same phone number! But she now had caller ID! When she saw it was Harvey, she answered the phone with, “What do you want? !” Steve answered by asking her how her husband was doing. She answered, “I’m divorced!” For the first time, Steve and Marjorie were both in the right place at the right time and this was the beginning of everything they both ever wanted. His career had taken off and now they were both unattached. The rest is romantic history! Their completely blended family includes seven children from previous marriages. There are no “step children” in the Harvey family. All seven kids are “their kids” and no one is a stepchild, an expression that the Harveys do not endorse or believe in.